We are so excited to have a new staff member on campus. Officer Ver Steeeg also known as Officer V, is joining our staff to help keep all of our Cheetahs safe and secure. 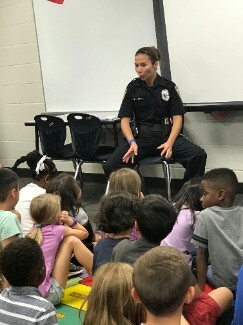 You can see Officer V doing a variety of task from helping in the morning and afternoons in car pick up line, walking the building, giving high fives to Cheetahs, and she even gets to enjoy reading a book with our Cheetahs. Our first graders were able to listen to Officer V read one of our favorite books, Officer Buckles and Gloria. Officer V was previously a police officer in the HEB area and she has a two year old son named Kinsler. If you see Officer V in the hallway give her a big high five and tell her thank you for being here on campus with us!